Thank you for again for another interesting mindfulness evening and for sharing your experiences to date. Here is a little summary of what we covered with a few notes on some home practice. Last week we looked at the mind slipping into “auto-pilot” and how frequently it does this. Many of you have started to become aware of just how often the mind “wanders”. This is great! It is natural to be impatient with mindfulness and want to be able to quieten your mind from the word go. However step 1 is “watching your mind” and once you start to do this you are beginning your mindfulness journey. The mind comes up with all sorts of STUFF! Have you started to notice the themes of thoughts that your mind generates?? This week we re-capped on the body scan and we used this as a way of becoming aware of how the body responds to emotions moving across the mind. Again this wasn’t about “stopping” the mind but just watching with a gentle curiosity where the mind went and then guiding it back to the here and now. We noticed some interesting things about where we experienced tension in the body and how our thoughts, emotions and actions all relate to each other. It is interesting how our bodies detect our thoughts before we’ve consciously registered them how the body often reacts to them as if they are real, even if they do not accurately reflect the world. We talked a little about the skier who just purely using his imagination to ski down an imaginary slope could actually simulate the same impulses in the body as if he were actually doing it. How powerful the mind is!! We also touched on how sensations in our bodies can be a very useful early warning system to detect emotionally charged thoughts. For example if we suddenly notice a tension in our chest or a panic feeling it may be that the mind is generating some negative thoughts that we are following. We also focused on the breath as an anchor to the here and now. The exercise sitting with breath is a great one for re-connecting us with what is going on in our body and mind in the present moment. 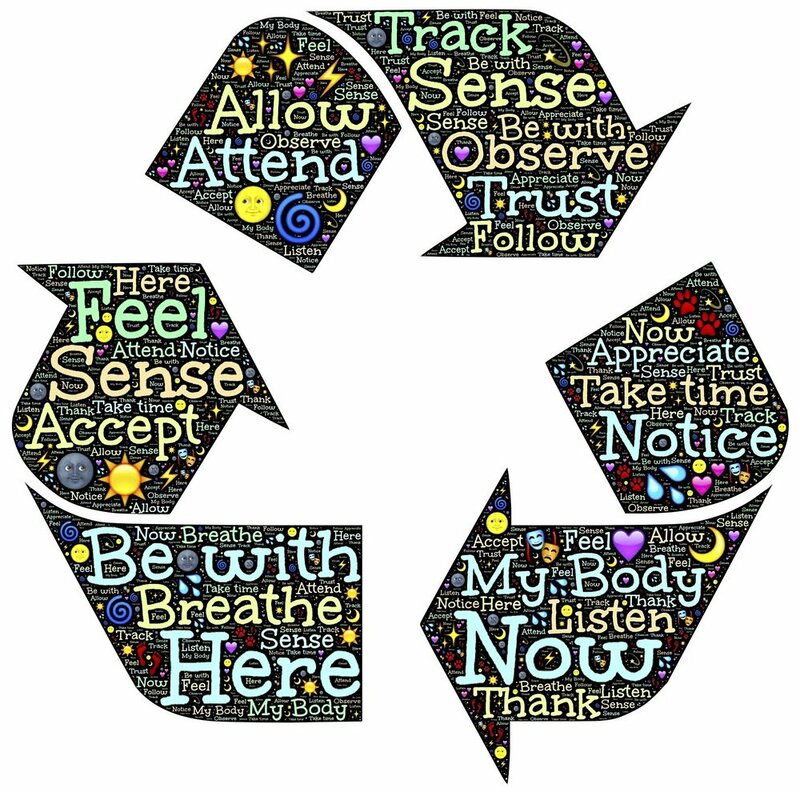 We discussed how the thoughts that come into our mind can impact on our breathing and how by simply watching the breath we can bring our awareness back to the here and now. Interestingly through watching the breath and without even attempting to change anything some of us noticed how things can naturally quieten down in the mind as well. It is from this place that we have access to our full resources to cope with the realties of life, whatever it brings. As promised here’s a little more info on the neuroscience behind mindfulness. It can be reassuring to know that there is lots of research showing the benefits of practicing mindfulness. Neuroscience encompasses any or all of the sciences, such as neurochemistry and experimental psychology, which deal with the structure or function of the nervous system and brain. A recent development in Neuroscience is the use of Functional Magnetic Resonance Imaging of (fMRI). Traditional MRI studies brain activity, fMRI studies brain function. Originating in 1990, functional magnetic resonance imaging, or fMRI, is a technique for measuring brain activity. It works by detecting the changes in blood oxygenation and flow that occur in response to neural activity. When a brain area is more active it consumes more oxygen and to meet this increased demand, blood flow increases to the active area. Increase in the ‘Insula’ region of the brain. This is an area of the brain which has been identified as being key in ‘self-awareness’ and ‘empathy' for emotions. Increased activity in the 'Hippocampus' which is the area of the brain that helps with ‘visual spatial memory’. There has also been decreased activity in the 'Amygdala' region which acts as a regulator for controlling emotion. The 'Prefrontal Cortex' (PFC) has also shown some increased activity. This region is attributed to executive function and attention control. Further research conducted by neuroscientist Richard Davidson, showed increased activity in the left frontal regions which have been shown to lift mood. Attention Regulation - training the brain's circuitry to concentrate on a particular task while acknowledging distractions. This will result in greater attentiveness. Emotional Regulation - An increase in one's ability to both control and extract information from our emotions. This improves the relationships we have with ourselves and others. Resilience - Mindfulness has been shown to be effective in reducing levels of stress and increasing levels of resilience. Here is a link to both the Body Scan (15 & 40 minute versions) and the 10 minute sitting meditation (Mindfulness of Breath). This is not my voice! 1) This week please have another go at practicing the body scan but this time ALSO listen to the mindfulness of breath exercise. If you can listen to both every day that would be great! Notice barriers and obstacles to doing your own practice and also notice what happens when you do sit down and do it. Ideally write your learnings in your mindfulness journal. 2) Fill out your pleasant/negative events form and bring your observations along to the next session (you will never be expected to share anything with the group if you don’t want to). 3) Carry out an activity “mindfully” this week. Take an activity which you would normally do in “thinking” mode and notice what happens when you bring mindful awareness to it.